It’s fair to say immersive tech is rapidly infiltrating the sporting world. With a market value of $100 billion, the sports industry is booming and primely placed for XR trends to slot into mainstream coverage and live action. For an industry where advertising, engagement and reach are so important, it’s clear why immersive tech has been welcomed so readily. With more sports fans than ever before engaging with their phones as well as the match (a thumb-twiddling 87% of us admit to second-screening whilst watching a game) the opportunities for supplementary content, applications and engagement are at an all-time high – but is there a legitimate place for immersive tech alongside our favourite sports, or is it all just a bit of a gimmick? 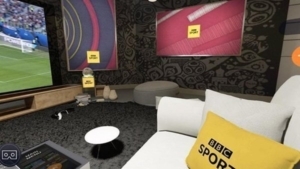 The BBC World Cup VR app allowed viewers to watch the tournament on a virtual BBC Sports sofa in a private studio. We all watched the World Cup play out this year, with the pint-throwing highs and heart-breaking lows that it brought to the nation. But it also highlighted the mainstream potential of VR in sports broadcasting. Each match at the World Cup was available to watch at home in VR thanks to the BBC, allowing viewers to feel closer to the action without having to fork out for the next flight to Russia. And they’re not the first – key games from NBA and NFL are available to watch in VR, indicating that there is a demand from fans to interact with their sporting heroes and become part of the game. And that’s the beauty of VR sports matches – as a generally privileged society, we have a ‘been there, done that’ attitude when it comes to watching sports. We’ve all watched tournaments on TV. Most of us have been to live sports fixtures, some even have season tickets. But who can say they’ve watched Kane score a hat trick from the subs bench? Who can say they’ve seen the pain on Murray’s face from the other side of the net? VR has the potential to ignite a new level of fan engagement with sports and evoke an intensified feeling of presence that watching from your usual seat just can’t bring anymore. The BBC VR app was downloaded a notable 325,000 times – but this pales in comparison to the 40 million viewers it attracted via more traditional viewing formats like live TV and on demand. So the market might be there but has perhaps not reached its full potential. Then there are the current technical limitations of the VR industry. Compared to the picture-perfect crispness of the 4K TV in your living room, the visual constraints (e.g. pixel density) of a VR sports match still leave a lot to be desired. It’s undeniable that some viewers will place visual quality over experiential feeling as a priority. However, with the immersive tech industry growing at an exponential rate the future is bright. Latest iterations of Head Mounted Devices (HMDs) already offer a much-improved viewing experience that reduces that ‘screen-door effect’, allowing you to see the sweat drip down your sporting hero’s nose right in front of you. There’s still a way to go before VR is the favoured viewing platform for the masses, but the seed has definitely been planted. Is AR the front runner? But VR can be a lonely experience – especially in a sporting context, where you want to share the excitement with friends rather than the inside of your Oculus. Social VR initiatives such as Facebook Spaces and Oculus Venues (see video above) have tried to tackle this problem, allowing the user to interact with fellow VR fans whilst watching live entertainment all over the world. But the focus on socialising with strangers and the avatarisation of users isn’t for everyone, which is why there’s a stronger argument for AR to go the distance when it comes to mass adoption within the sports industry. AR headsets at stadiums, which could be on the cards later this year, will allow the user to interact with live action, pulling up statistics and extra information on the match and players, whilst still enjoying the live atmosphere of the stadium and their friends around them. Facilitating an experience in this way is something VR simply can’t match right now. It’s a win-win situation for fans and the stadiums, resulting in an improved viewing experience for the user and increased revenues for venues. MR headsets like the Microsoft Hololens are also providing ways for fans to watch 3D reconstructions of real matches on any surface – like this impressive end-to-end system researchers have developed that gives a whole new meaning to Table Football. Various clubs and leagues are already testing the waters with AR; MLB’s ‘At Bat’ app encourages user interaction live on game day, allowing fans to pull up stats on each player on the field and follow the speed and trajectory of each hit. AR applications have also found a place outside of the stadium. Take German club FC Bayern, who have released an augmented feature on their iOS application, allowing users to pose for selfies with their favourite player, customise their own jersey and share the results on social media. Using AR in this way is an ingenious and effective way to increase fan engagement from both the stands and the sofa. But the immersive tech takeover isn’t just confined to fan engagement. There’s a rising trend for wearable tech in sports training, with the NFL along with many NCAA teams utilising XR as a guidance tool for athletes. In a sport where injuries and concussions are so commonplace, VR could really act as a safeguard to aspiring quarterbacks and assist them in learning plays without risking injury. Other important features of sports wearables such as measuring heart rate and respiration are equally valuable tools in helping athletes train better and faster. French startup PIQ teamed up with Everlast to design an innovative AI wearable for the boxing industry that can track and analyse boxer’s movements that are imperceptible to the human eye. And it’s not just aiding the professionals – Boltt’s AI trainer is a fitness fanatic’s ultimate training companion, giving intelligent personalised feedback to help improve performance. The integration of AI with wearable tech to track data and provide recommended areas for improvement is what really secures this application a place in the future of the sports industry. 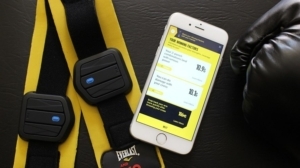 PIQ’s innovative boxing wearable allows users to monitor their power and track their progress. All of these examples of how immersive technologies and intelligent machines are being used or may be used, are framed around sports as we currently know them and the impact on audiences. Beyond that though, there is an argument that the sports we all know and love now may well change dramatically in a future where currently nascent immersive technologies have matured and AI/Machine Learning is simply an accepted part of everyday life. Let’s look again at boxing. This is a sport that over the years has evolved due to changing public opinion and the perceived safety of the athletes. In the early 20th Century bouts would have no limit on the number of rounds, effectively going on until one of the fighters gave up or the police stopped the fight. In the 1920s a 15 round limit started to become the norm – up until the death of a fighter Duk Koo Kim in the 14th round of a CBS televised fight in 1983. Not coincidentally, the next iteration – a 12 round fight – could be neatly be televised within a one hour slot, another factor that many feel contributed to the WBA rule change. So here we have a sport that has already evolved and seems likely to continue. Imagine a future where that evolution does not stop purely in the physical world, where it’s possible to track a VR boxer’s body movements precisely, along with their biometric data. A bout could take place between two VR boxers who are on different sides of the planet, who in reality might be in completely different weight classes. Maybe their avatars are not representative of their human form but are instead virtual embodiments of their specific fighting attributes. Maybe they could even develop ‘special moves’ through training. Yes, it’s probably a little far fetched that immersive technology will prompt boxing to become a real-life (virtual) version of Street Fighter. And it might be a while before we can KO Floyd Mayweather from the comfort of our own living room. But if it was possible to engage in this way, we’d do it. There are countless examples of the different ways that immersive tech has already been adopted by the sporting world; some work well, and others certainly have room for improvement. But it’s undeniable that XR trends are pioneering a revolution in the way that we watch and enjoy sport, as well as participate in it.